1951 Rose Bowl Highlights - Ohio State vs. Oregon - 51 minutes. 1958 Colts at Giants - NFL Title Game - "The Greatest Game Ever Played" - as presented by ESPN & NFL Films (2008) - colorized, 2 hours with comments & interviews with many of the players. Time For Football (1954 NFL Highlight Show) - weeks 1 & 6 with original commercials, 1 hour. 1956 NFL Championship - Bears at Giants - edited with Gifford, Blanda and more. 1958 Rose Bowl Highlights - Ohio State vs. Oregon, 51 minutes. 1960 NFL Championship Highlights - Packers at Eagles. 12/2/61 Auburn at Alabama - edited, b & w.
1961 NFL Championship - Giants at Packers - complete with Huff, Nitschke, Grier, Gregg, Brown and more. B&W. 1962 AFL Championship - Texans at Oilers - Blanda, Cannon, Brooker and more. Missing a few plays. B&W. 1962 NFL Championship (Packers vs. Giants) Film - about 27 minutes. 1962 All - American Team - 26 minutes, B&W. 1962 College Football Highlights - 83 minutes, B&W. 1963 All American Team - Staubach, Sayers, Butkus and more. About 25 minutes. B&W. Touchdown : 1963 College Football Highlights (weeks 7, 8 & 9) - 78 minutes, B&W. 1965 AFL and NFL Highlights - 1 hour with Blanda, Namath, Kemp, Starr, Sayers, Butkus, Brown, Unitas and many more. 1965 W.Division Playoff - Colts at Packers - NFL Films, 24 minutes. 1965 NFL Championship (Packers vs. Browns) Film - about 24 minutes. 1966 Gator Bowl - Tennessee vs. Syracuse - complete game with Csonka, F.Little and more. 1966 Game Of The Week - Bears at Vikings, 25 minutes. 11/19/66 Notre Dame at Michigan State - #1 vs. #2 in "The Game Of The Century". Two undefeated teams meet in East Lansing. Bleier, Smith, Page, Hanratty, Kenney and more. In color, edited for TV, 2 hours. Pieced together mix of game film and TV telecast - b&w and color - 90 minutes. 11/13/66 49ers at Bears - edited, about 28 min. 11/26/66 Notre Dame at USC - silent game film, b+w, 48 minutes. Super Bowl I (1967) - Packers vs. Chiefs - an outstanding audio/video merge. 1967 USC at UCLA - complete with O.J., Beban, Farmer, Jones and more. 1967 - The Ice Bowl - NFL Championship Game - Cowboys at Packers - Not the actual broadcast but close; as presented by NFL Films. 90 minutes. 9/27/75 Penn State at Iowa - complete with Andress, Tunnell and others. 10/20/75 Giants at Bills - Simpson, Morton, Ferguson & more. 11/1/75 USC at California - complete with Muncie, R.Bell, G.Jeter, C.Matthews and more. 11/10/75 Chiefs at Cowboys - complete with Staubach, Lanier, Jordan, Matuszak, Jordan and more. 1975 AFC Championship - Raiders at Steelers - complete with Bradshaw, Stabler, Harris, Swann, Tatum, Hendricks, Bleier, Branch and more. Super Bowl IX - Steelers vs. Vikings - complete with Bradshaw, Tarkenton, Harris, Foreman, Greene and more. 1/4/76 - 1975 NFC Championship - Cowboys at Rams - Pregame Show, 1st and 4th Quarters only. 1976 Orange Bowl - Michigan vs. Oklahoma - complete with Leach, Selmon, Peacock and more. 1976 Rose Bowl - UCLA vs. Ohio St. - complete with Griffin, Sciarra, Greene, Tyler, Cross and others. 1976 Pro Football Playback - Weeks 1 -15. 1976 Steelers at Vikings - complete with Harris, Page, Bradshaw, Swann, Ham, Eller, Marshall and others. 9/19/76 - Rams at Vikings - Complete OT Game with Tarkenton, Haden, Youngblood, Foreman, Olsen, Page and more. 1976 AFC Championship Game - Raiders at Steelers - complete with Bradshaw, Stabler, Greene, Biletnikoff, Swann, Ham, Caspar, Branch and others. TVTV Goes To Super Bowl X - A pregame special of sorts with Bill Murray, Phyllis George and more. Super Bowl X - Steelers vs. Cowboys - complete with Swann, Bradshaw, Staubach, Harris, Lambert, Pearson, Newhouse, Greene and more. 1977 Gator Bowl - Pittsburgh vs. Clemson - Fuller, Cavanaugh, Bostic and others. 1977 Orange Bowl - Ohio St. vs. Colorado - complete with Gerald, P.Johnson and others. 1977 Sugar Bowl - Pittsburgh vs. Georgia - complete with Dorsett, Cavanaugh, Jones and more. 1977 Notre Dame vs. USC - "The Green Jersey Game" - complete with Montana, Golic, MacAfee and more. 1977 Giants at Falcons - complete with Carson, Csonka and others. 11/27/77 Vikings at Packers - complete Snow game with White, Foreman, Marshall, Rashad, Whitehurst and others. Super Bowl XI - Raiders vs. Vikings - complete with Stabler, Tarkenton, Caspar, Biletnikoff, Rashad, Van Eeghen, White and more. 10/30/77 Bears at Packers - complete with Payton, Dickey, Avellini, Morris, Bender and more. 1967 NFL Team Films - includes Cowboys, Chiefs & Giants. 1/1/68 Rose Bowl - USC vs. Indiana - silent color game film. 44 minutes. 1968 Orange Bowl - Oklahoma vs, Tennessee - complete with Warmack, Warren, Flowers, Fairbanks and more. 1968 #1 Purdue at #4 Ohio St. - black & white no huddle edit with play by play merge - Tatum, Phipps, Brockington, Kern & others. 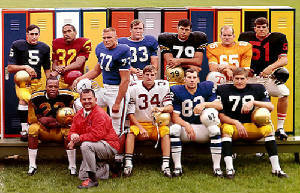 1968 All American Team - O.J., Hanratty, Douglass, Stanfill and others. About 25 minutes. 1968 This Week In The AFL - weeks 1 - 12. 11/23/68 Yale at Harvard - "The Game" - complete with Dowling, Tommy Lee Jones and more. Yale Beats Harvard 29 - 29 (2008) - Documentary of The game. 1969 Texas Silent Coaches Films - California, Texas Tech, Navy, Oklahoma, Rice, SMU, Baylor, TCU, Texas A&M and Arkansas. 1969 Rose Bowl - Ohio St. vs. USC - complete with O.J. Simpson, Otis, Kern, Sogge and more. 1969 Texas at Arkansas - Complete with Koy, Garber, President Nixon's arrival & postgame visit to the locker room. Also - the Texas silent coaches game film. College Football Today (10/4/69) - complete show with original commercials. 10/11/69 Oklahoma at Texas - complete game with Owens, Mitchell, Street, Mildren and others. 1969 This Week In Pro Football - complete shows from weeks 1 - 15. Super Bowl III - Jets vs. Colts - complete with Namath, Boozer, Unitas, Gowdy, Pregame and more. 8/16/69 Bears at Packers - 20th Annual Shrine Game with Butkus, Starr, Sayers, D.Anderson, O'Bradovich, Nitschke, Piccolo and more. B+W, missing last 20 seconds of game. 11/22/69 Ohio State at Michigan - complete with Pierson, Tatum, Otis, Brockington, Kern, Moorhead, Dierdorf and others. 1969 Vikings at Giants - partial game, part of 3rd quarter and all of 4th. About 53 minutes. Number One (1969) - Charlton Heston as a washed up Saints Quarterback. Includes many actual New Orleans players. 1970 Rose Bowl - Michigan vs. USC - complete with Dierdorf, Jones, Moorhead and others. 1970 Sugar Bowl - Mississippi vs. Arkansas - complete with Manning, Montgomery and more. Super Bowl IV - Chiefs vs. Vikings - complete with Dawson, Page, Taylor, Kapp, Lanier, Henderson, Garrett, Eller and others. Mostly B&W, end and postgame in color. 1970 Giants at Steelers - complete, first ever Monday Night Broadcast with Tarkenton, Bradshaw and more. 1970 Michigan at Ohio State - complete with Brockington, Dierdorf, Tatum, Kern and others. 1970 Jets at Browns - complete MNF game with Namath, Kelly, Cosell, Jackson, Meredith and more. 12/18/77 Bears at Giants - complete game played in rain, sleet and snow. Payton, Carson, Avellini, Buffone, Plank, Csonka, Scully, Morris and more. 1977 Raiders at Colts - complete AFC Divisional Playoff Double Overtime Game with Stabler, Jones, Branch, McCauley, Matuszak, Biletnikoff, Caspar, Madden and more. 1977 Raiders at Broncos - complete AFC Championship Game with Stabler, T.Jackson, Gradishar, Biletnikoff, Caspar, Morton and others. Something For Joey - 1977 TV Movie about the relationship between John Capalletti and his younger brother Joey. 1978 Cotton Bowl - Notre Dame vs. Texas - edited with Montana, Ferguson, Heavens and others. 2 hours, 47 minutes. 1978 Gator Bowl - Clemson vs. Ohio St. - complete with the Woodie Hayes incident, Schlitcher, Sims, Fuller, Clark, Butler and others. 1978 Pittsburgh at Notre Dame - complete with Montana, Ferguson, Jones, Trocano and more. Super Bowl XII - Cowboys vs. Broncos - complete with Staubach, Dorsett, Morton, Alzado and more. 1978 Cowboys at Cardinals - complete with Staubach, Hart, Dorsett, Gray, Dierdorf and others. 1978 Saints at Steelers - complete with Manning, Bradshaw, Muncie, Harris, Swann, Lambert and more. 1978 Dolphins at Oilers - complete MNF game with Campbell, Griese, Pastorini, Little, Renfro and others. 9/17/78 Seahawks at Jets - complete with Largent, Walker, Zorn, Todd and more. 9/18/78 Colts at Patriots - Complete MNF Game with Grogan, Hannah, Francis & more. 9/30/78 TCU at Penn State - complete with Suhey, Bayuk, Moore and others. 11/19/78 Eagles at Giants - complete with Carmichael, Jaworski, Pisarcik, Montgomery and more. 1979 Cotton Bowl - Notre Dame vs. Houston - complete with Montana, Browner, Gloic and others. 1970 Chiefs at Colts - complete MNF Game with Unitas, Dawson, Cosell and others. 1970 Cardinals at Cowboys - complete MNF Game with Lilly, Hart, Morton, Wilson, Hayes, Cosell, Jackson, Meredith and others. 1970 Giants at Cardinals - last 3:30 and postgame only. Also includes the Game Of The Week show highlighting this game. About 30 minutes total. 10/26/70 Rams at Vikings - complete MNF Game with Gabriel, Tinglehoff, Snow and others. 11/23/70 Giants at Eagles - complete MNF game with Tarkenton, Snead, Cosell (drunk?) and others. 12/26/70 Lions at Cowboys - NFC Playoff Game - complete with Morton, G.Landry, Renfroe, Karras, Thomas, Hayes and more. 1970 NFC Championship - Cowboys at 49ers - complete with Ditka, Brodie, Morton, Spurrier, Reeves, Johnson, Adderley, Hill and more. 1971 Sugar Bowl - Tennessee vs. Air Force - complete with Scott, Parker, Jennings and more. 1971 Big Ten Highlights - covers all 10 teams, about 25 minutes. 1979 Rose Bowl - USC vs. Michigan - complete with White, Leach, McDonald, OJ, Gowdie, pregame and more. Super Bowl XIII - Steelers vs. Cowboys - nearly complete with Bradshaw, Staubach, Harris, Stallworth, Dorsett, Greene and more. 1979 Steelers at Browns - complete with Bradshaw, Sipe, Harris, Newsome, Swann and others. 1979 Browns at Steelers - Harris, Alzado, Bradshaw, Sipe, Greene, Pruitt and more. 1979 Penn State at Nebraska - complete with Suhey, Hipp, Tate, Hager, Millen and others. 10/6/79 Penn State at Maryland - complete with Tate, Suhey, Wysocki, Millen and others. 10/13/79 Army at Penn State - complete with Suhey, Walker, Tate, Bennett and more. 11/?/79 Oilers at Cowboys - complete with Campbell, Staubach, Dorsett, Pearson, Pastorini and more. 10/25/79 Chargers at Raiders - complete MNF game with Fouts, Stabler, Upshaw, Shell, Jefferson, Branch, Joiner, Chester and more. 11/21/70 Bears at Vikings - Complete with Payton, Foreman, R.Young & others. 12/1/79 Penn State at Pittsburgh - complete with Marino, Suhey, Tate and others. 12/3/79 Raiders at Saints - MNF game with Stabler, Manning, Muncie, Dobler, Hendricks, Hayes and others. 12/16/79 Cardinals at Bears - Complete with Payton, O.Anderson & more. 1980 NFL Review And Preview - weeks 1 - 19. 1980 Wild Card Playoff Game - Oilers at Raiders - complete with Plunkett, Campbell, Chandler, Stabler, Upshaw, Shell and more. 1980 Divisional Playoff Game - Raiders at Browns - complete with Plunkett, Sipe, Alzado, Shell, Upshaw, Hill and others. 1/6/80 - 1979 AFC Championship Game - Oilers at Steelers - complete with Bradshaw, Campbell, Harris, Stallworth and more. 11/12/80 Oilers at Chiefs - Complete with Stabler, E.Campbell, Fuller & others. 1980 NFC Championship Game - Cowboys at Eagles - complete with Dorsett, Jaworski, Carmichael, White, Montgomery, Martin and more. 1971 Cardinals at Chargers - complete MNF Game with Hart, Hadl, Wilson, Lane, Garrison and others. 1971 Giants at Cowboys - complete MNF Game with Staubach, Tarkenton, Alworth, Hayes, Thomas and more. 1971 Colts at Vikings - complete with Morrall, Cuozzo, B.Smith, Page, Matte and others. 1971 Rams at Colts - complete with VP Agnew, Gabriel, Morrall, Matte, Snow, Curtis and others. 8/30/71 Jets at Chiefs - complete MNF Game with Dawson, Snell, Taylor, Maynard, Podolak, Lanier and more. 12/13/71 Redskins at Rams - complete MNF game with Gabriel, Jurgenson, Rentzel, Olson, Brown and others. Three Cheers For The Redskins (1971) - 51 minute Year In Review Special by NFL Films. Raiders at Steelers - AFC Divisional Playoff : The Immaculate Reception. 1/2/72 The NFL Today - NFC Championship Game (Cowboys & 49ers) Pregame Show with original commercials. 1972 Rose Bowl - Stanford vs. Michigan - complete with Siemon, McKenzie, Darden, Taylor and more. 10/72 Alabama at Tennessee - edited. 10/9/72 Raiders at Oilers - complete MNF game with Lamonica, Pastorini, Blanda, Biletnikoff, Joiner and more. 11/26/72 Vikings at Steelers - complete with F.Harris, Tarkenton, Bradshaw, Gilliam & others. 1972 Cardinals at Dolphins - complete MNF game with Csonka, Kiick, Morris, L.Wilson and more. Super Bowl VI - Dolphins vs. Cowboys - complete with Griese, Staubach, Buoniconti, Hill and more. Super Bowl XIV - Steelers vs. Rams - complete with Bradshaw, Stallworth, Anderson, Ferragamo and others. 1980 Notre Dame vs. Miami. 1981 Rose Bowl - Michigan vs. Washington - complete with Woolfolk, Carter, Flick, Wrangler and more. 1981 #2 Oklahoma at #1 USC - complete with M.Allen and others. 1981 Lions at Redskins - Complete with Theismann, Sims, Monk, Hipple & more. 10/17/81 Alabama at Tennessee - edited huddles. 11/15/81 Steelers at Falcons - Complete with Bradshaw, Bartkowski, Harris, Lambert & others. 11/26/81 Bears at Cowboys - Complete with Payton, Dorsett & more. 12/13/81 Chargers at Buccaneers - Complete with Fouts, D.Williams, Muncie, House & more. Legends Of The Fall (1981) - NFL Films choices for best Running Backs, Quarterbacks and Team. Also includes The New Breed - about 51 minutes total. Super Bowl XV - Raiders vs. Eagles - complete with Plunkett, Carmichael, Cunningham, Matuszak, Branch, Montgomery, Hayes and more. 1/2/82 Chargers at Dolphins - Complete Overtime Divisional Playoff with Strock, Fouts, Winslow, Nathan, Muncie & others. 1/10/82 Cowboys at 49ers - complete NFC Championship Game with Montana, Clark, Dorsett, Lott, "The Catch" and more. 10/30/82 Penn St. at Boston College - complete with Warner, Blackledge and more. 1982 Stanford at California - complete game with Elway, Garner, Ford and the Stanford Band. 1/23/83 Jets at Dolphins - complete AFC Championship Game with Gastineau, Woodling, Todd, McNeil and more. 11/6/83 Dolphins at 49ers - 1st ever Matchup of Montana & Marino. Super Bowl XVII - Redskins vs. Dolphins - complete with Riggins, Theismann, Brown and more. 1984 Fiesta Bowl - Ohio St. vs. Pittsburgh - complete with Tomczak, Byars, Doleman, Maas and others. Super Bowl XVIII - Raiders vs. Redskins - complete with Allen, Alzado, Theismann, Plunkett, Riggins and more. 1984 Michigan at Ohio State - complete with Tomzcak, Carter, Byars and others. 9/30/84 Cowboys at Bears - complete with Payton, Dorsett, Hampton, Singletary and more. 10/17/84 Saints at Bears - Payton breaks the All-Time Rushing Record. Complete game. 1973 Rose Bowl - USC vs. Ohio St. - complete with Swann, Cunningham, Griffin, Harris and others. 1973 Sugar Bowl - Notre Dame vs. Alabama - complete with Caspar, Clements, Todd, Stock and more. 1973 Alabama at Kentucky - edited. Super Bowl VII - Dolphins vs. Redskins - complete with Griese, Csonka, Kilmer, Scott, Yepremian and more. 9/16/73 Oilers at Giants - partial game, parts of 2nd & 3rd quarters, about 30 minutes. 9/17/73 Jets at Packers - complete MNF game with Namath, Riggins, Brockington, Cosell, Meredith, Gifford and more. 9/23/73 Jets at Colts - partial game, 1st Half only. 10/22/73 Raiders at Broncos - complete MNF game with Stabler, Johnson, Biletnikoff, Otto, Little and others. 12/3/73 Steelers at Dolphins - complete MNF game with Harris, Griese, Csonka, Cosell, Meredith, Gifford and more. 11/23/84 Boston College at Miami - Flutie vs. Kosar, complete game. 1985 USC at Notre Dame - complete with Pinckett, Beuerlein and others. Super Bowl XIX - 49ers vs. Dolphins - complete with Montana, Marino, Lott, Craig, Clayton and more. 9/19/85 Bears at Vikings - complete MNF game (on Thursday) with McMahon, Payton, Kramer, Dent and more. 9/29/85 Redskins at Bears - complete with McMahon, Theismann, Payton, Riggins, Monk, and more. 1/1/74 Orange Bowl - LSU vs. Penn St. - complete with Cappelletti, Shuman, Herd and more. 1974 Rose Bowl - USC vs. Ohio St. - Haden, Griffin, Colzie and more. Mix of Game Film and ABC Telecast. Super Bowl VIII - Dolphins vs. Vikings - complete with Griese, Tarkenton, Csonka, Foreman, Warfield and others. 9/14/74 Stanford at Penn State - Complete with Cordova, Shuman & more. 9/23/74 Cowboys at Eagles - complete with Staubach, Gabriel, Carmichael, Hill and more. 11/23/74 Michigan at Ohio State - complete with Griffin, Baschnagel, Franklin and more. 12/16/74 Cowboys at Raiders - complete with Stabler, Staubach, Lilly, Biletnikoff, B.Smith, Garrison and others. 12/21/74 AFC Divisional Playoff - Dolphins at Raiders - "The Sea Of Hands" game as presented by NFL Films - Stabler, Griese, Warfield, Davis & more. 1975 Orange Bowl - Notre Dame vs. Alabama - complete with Clements, Todd, MacAfee, Newsome and others. 1975 Cowboys at Vikings - complete Playoff Game with Staubach, Tarkenton, Marinaro, Foreman and more. 9/22/75 Raiders at Dolphins - complete MNF game with Griese, Stabler, Branch, Morris, Biletnikoff, Sistrunk and more. 10/21/85 Packers at Bears - complete MNF game with Payton, Fridge, Lofton, Singletary and more. 11/3/85 Bears at Packers - complete with Payton, Fencik, Zorn, Lofton and others. 11/16/85 - Notre Dame at Penn St. - complete with T.Brown, Shaffer, Dozier, Pinkett and more. 11/17/85 Bears at Cowboys - complete with Payton, Dorsett, pregame with Sayers and more. 11/18/85 - Giants at Redskins - complete "Thiesmann Game" with Riggins, Monk, Taylor, Simms and more. 12/1/85 Buccaneers at Packers - complete snow storm game with Young, Lofton, Dickey and more.